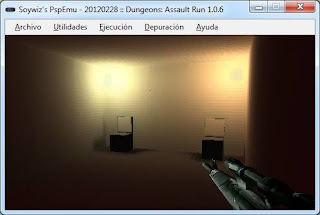 Today I release a new version of my emulator. 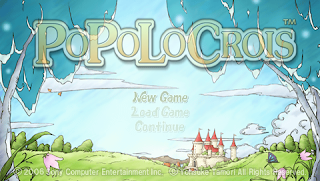 This time it is a completely rewritten emulator from scratch. Now it's written in C# instead of D, and features a dynamic recompilation instead of the old interpreter. Though at this moment the cpu is monothreaded. I will make it optionally multithreaded in the future for games that works fine with multithreading. You can grab the sources with TortoiseGit and compile with Visual C# Express 2010. It requires .NET Framework 4.0 to start. "OpenMG Setup Update Program" and "DirectShow's WavDest" to play background music in games. In order to register WavDest: "regsrv32 WavDest.dll"
This emulator features a "fast memory" option that will improve the speed a lot, but it has some issues with some games (though not many), so it's disabled by default. You can check the improvement of using this memory with the minifire (with vsync off) or compilerperf demos. 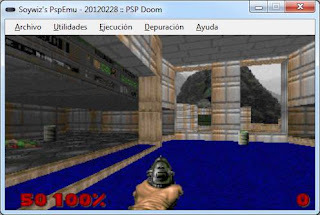 This is the first public release of the emulator and I have just tested it on my computer, if you have any issue with it, please comment here and I will try to help you. The quality of the generated code is fantastic. Lots of MIPs instructions encodes in a single X86 instruction. to a register is as fast as accessing a non-virtual field. 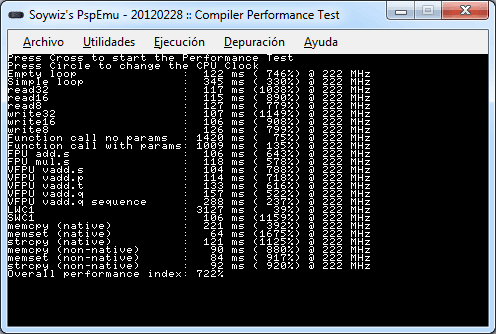 Using VirtualAlloc/mmap, allows all the PSP Memory Segments to be in a virtual space that fits the PSP Memory. And since there is no DMA access on a HLE emulation, we can get a pointer just making an ADD operation between the base and the PSP address. This is as fast as possible. and flushing a range or the whole Function Cache is as fast as possible too. that allows to know which functions have been generated and should be purged when invalidating instruction cache. so instead of restoring the registers, it just resumes the thread execution. Skiping completely the register restoring. LINQ + functional-programming helps to make the code very clean, simple and easy to understand. /// Get the size of the largest free memory block. C# support of structs and pointers, allow the HLE functions to use pointers directly and seamlessly. /// Reads an entry from an opened file descriptor. Most CPU/FPU/VFPU operations are something like 8x times faster than the original PSP on a modern computer. Still the GPU implementation is still limited because of the Cpu <-> Gpu memory BUS. But probably will be enough in most cases. the quality of the core is a priority always over new features. CPU/Gpu Instruction decoding, assembler and disassembler share a single table with the instruction descriptions that will allow generating the required code on the fly. The idea is to create a full set of tests, testing the emulator interface, code generation, and HLE APIs. UnitTests are integrated in the code, and HLE APIs are external integration tests in form of PSP executables than can be executed on any emulator to test APIs. Project is on GitHub, so anyone can branch the project and perform Pull Requests helping to improve the code. to improve the quality of the code in each iteration. and made it impossible to refactoring the code without days or weeks of work. In this time I have learned lot of things, and since the .NET platform is fast enough, have "mono", and solves all my problems with D, it will be my final choice. platform/language out there. It has the right balance between ease, power and speed. Of course it lacks some stuff, but it is the language where less programming features I have missed. I didn't used the pspplayer code as base because I wanted to make things with all the stuff I have learned this time and with a different approach. 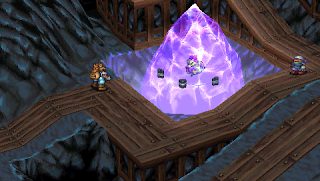 I started the first version of my emulator using Noxa's pspplayer as base. I didn't managed to compile his code that time because of a mixed DLL x86/x64, and I wanted to learn to make an emulator. 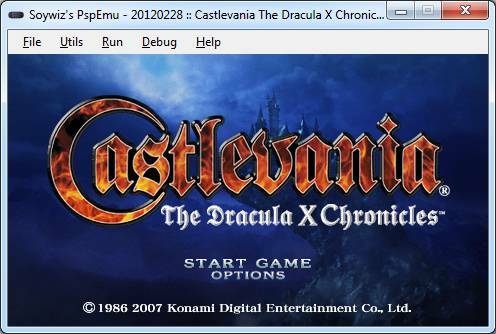 The old D version of the emulator can be found here: old version. 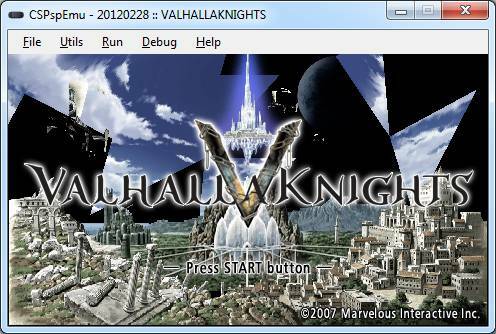 You can use this emulator for homebrew development. Just call the executable with the PBP or ELF file to execute as argument. Also, you will be able to see STDOUT/STDERR printf stuff on the console. Also, you can autorun a PSP game with this emulator, just rename the cspspemu.exe to the name of the ISO/CSO or PBP and it will run automatically without menus. 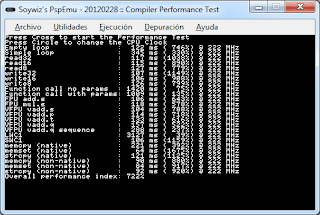 "MyGreatPspGame.cso", just rename the cspspemu.exe to "MyGreatPspGame.exe"
Also has some manually CWCHEAT support. If you have an iso called "MyGame.iso" you can create a "MyGame.iso.cwcheat", and put there cwcheat codes.